Here in the U.S., there’s been a lot of buzz about Rand Paul, son of Ron Paul, winning the primary for Republican senator in Kentucky. 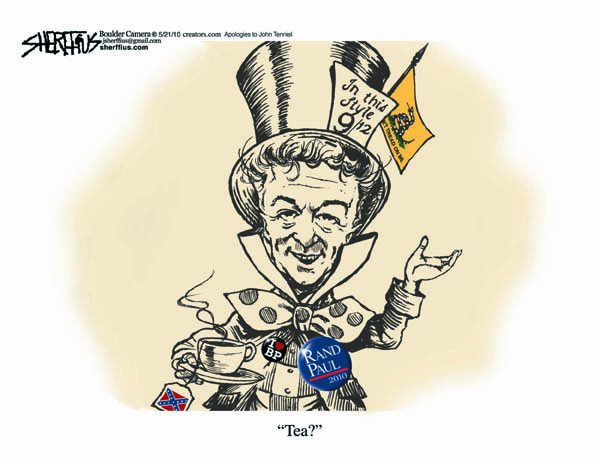 Paul is a darling of the Tea Party and largely espouses libertarian values of decreased taxes and decreased government regulation and intervention. There are some things about libertarianism that I like and agree with. I’m against state interference in romantic and/or sexual relationships between consenting individuals with full capacity. I’m in favor of strong civil liberties and freedom from search or surveillance by the state. You know a lot of things on employment ought to be done locally. You know, people finding out right or wrong locally. You know, some of the things, for example we can come up with common sense solutions — like for example if you have a three story building and you have someone apply for a job, you get them a job on the first floor if they’re in a wheelchair as supposed to making the person who owns the business put an elevator in, you know what I mean? So things like that aren’t fair to the business owner. Yes! Let’s let the free market take care of rights for people with disabilities! Because it’s for damn sure that even with the existing governmental protections for civil rights, companies are taking an unbiased and totally not ableist at all approach to employing PWDs and even accommodating them as customers! So eliminating those marginally adequate and woefully underenforced protections would surely have the effect of enhancing overall liberty and freedom! That is, if you are looking only at the liberty and freedom of the already privileged. There has been a lot of discussion on this site of how entrenched institutional ableism results in discrimination against PWDs, makes them more likely to live in poverty, lack employment, and have disproportionately negative health outcomes. That’s the status quo that would be preserved if government intervention and regulation of the rights of PWDs were to end. But there are definitely people who are benefiting from the status quo – white, cis, hetero, TAB men, predominantly. And we should be very clear that limiting government intervention would primarily preserve the status quo that benefits them. Which is why you should not be surprised by two facts: 1) Rand Paul is a white cis hetero TAB man, and 2) I strongly disagree with these political ideas. While there are some areas in which I support limiting government intervention, my overall goal is to maximize rights of historically disadvantaged and relatively unprivileged populations, whether it takes more or less government to reach that end. 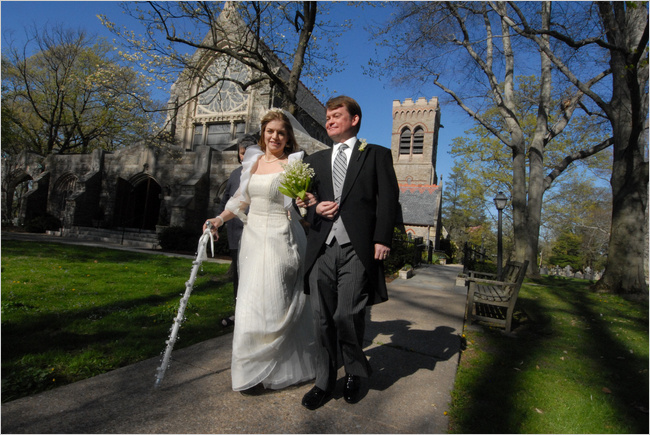 Alexandra Lammers and Eric Hoyle, she in a wedding dress with a festively decorated cane and he in a morning suit exit the church after their wedding. Photo from The New York Times Vows article about Lammers’ and Hoyle’s wedding. While Lammers was using a cane due to an injury, rather than a disability, it was still nice to see a mobility aid in the New York Times like this. 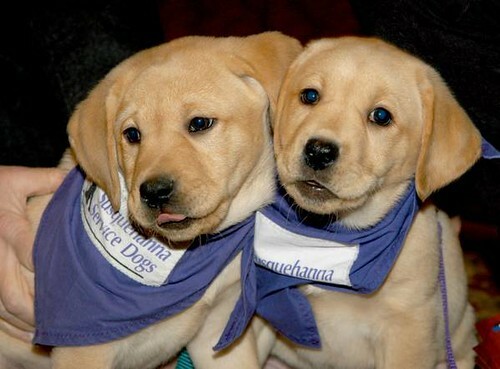 On the first day Ms. Kysel took Penny, [her allergy-detection service dog] to work, one of her co-workers suffered an asthma attack because she is allergic to dogs. That afternoon Ms. Kysel was stunned when her boss told her that she could no longer take the dog to work, or if she felt she could not report to work without Penny, she could go on indefinite unpaid leave. She was ineligible for unemployment compensation because of the limbo she was put in. Women with disabilities in the Upper East Region has called on society not to see them as liabilities but help empower them so they could take care of themselves. They complained that many people regarded them as a curse to their families and did not want to associate with them especially in issues of marriage. They explained that when they receive marriage proposals the potential groom’s family would usually argue that the disabled woman would join the family with her curse and discourage their son. These concerns were raised at a meeting of the Association of Women Living with Disabilities, held in Bolgatanga, to discuss their situation and find ways to make things better for their members. I have a lot of people in my family with disabilities, though none of them would consider themselves disabled. In talking with another radical woman of color, it seems that disability is so the “norm” in our communities, it’s often not marked as an identity unto itself. I often wonder about what a release it might be for women of color to see disability as a framework that intersects with race and gender, to not always feel the need to keep fighting, even when it hurts, to let go of the ways that we as cis and trans women of color in particular, have taken up ableism in ways that reproduce harm to ourselves and the communities we “work” so hard and care for. Why does disability mostly look white? The federal government accused Arkansas in a lawsuit Thursday of leaving people with severe mental or physical disabilities with no choice but to go into state institutions. The Justice Department lawsuit accused Arkansas of a “systemic failure” that places people in institutions when the state should pursue less restrictive avenues for their care. “The state gives individuals with developmental disabilities the draconian choice of receiving services in segregated institutions or receiving no services at all,” the lawsuit states. The federal government accused the state of violating the Americans with Disabilities Act, which guarantees people with developmental disabilities the right to live in the most appropriate setting for their needs. The state has six centers for the developmentally disabled that, in all, care for about 1,100 people. 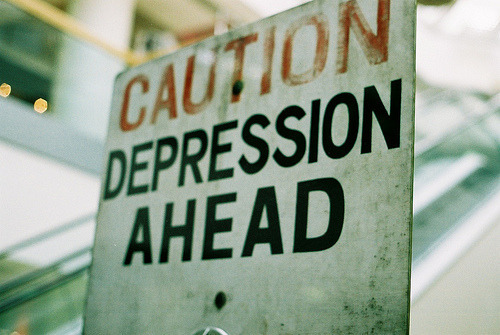 A faded street sign reading 'CAUTION DEPRESSION AHEAD' is in focus with a blurry background of escalators. Photo credit unknown, seen at Nowhere Pixie.